The Eagles' wide receivers has been trending in the wrong direction for a few years now, which is not exactly surprising given the unit keeps on losing Pro Bowlers. First, DeSean Jackson was released, perhaps justifiably so depending on your perspective — financial or culture. Then last offseason, Jeremy Maclin left through free agency after the organization low-balled him with their offer. Both were in their prime and coming off of career years. It's not that the Eagles haven't tried to replace Jackson and Maclin, spending a first-, second- and third-round draft picks on the position in 2014 and '15. Of course, just because you invest the selections doesn't mean they're going to produce star players. It was a gamble, one that so far has not paid off, as nobody has come close to matching the consecutive 80-catch, 1,300-yard, nine-touchdown seasons those two posted in the feature role. This offseason, the Eagles got rid of a little dead weight in the form of Riley Cooper and Miles Austin, and brought in some new auxiliary parts in Rueben Randle and Chris Givens. Yet if this group is going to become a strength of the team, it's going to be because Jordan Matthews, Josh Huff and/or Nelson Agholor start living up their promise. If that trio isn't better, the receiving corps as a whole almost certainly are not either. 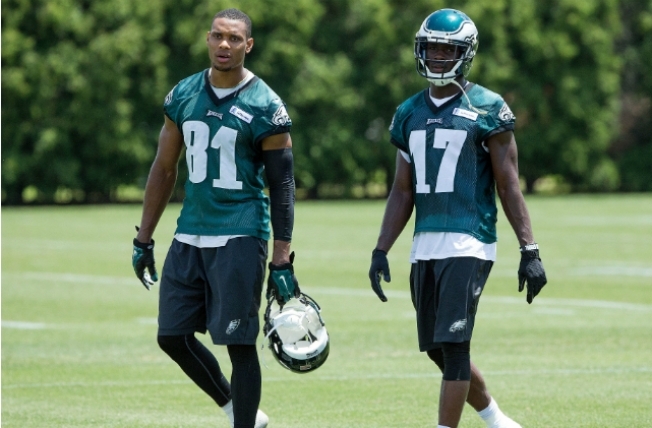 Is Agholor ever going to become a feature receiver? Was he worth the 20th overall pick in last year's draft? Perhaps not, but we aren't buying fears that he's forever going to be as much of a non-factor as he was last season. Even as rookie seasons go, Agholor's was a massive disappointment, finishing with just 23 receptions for 283 yards and one touchdown. To put that in perspective, Riley Cooper had more yards and Miles Austin as many scores in the same offense. Agholor has got to be better than that, and he should be. Keep in mind, a high ankle sprain cost him three games and likely lingered for a lot longer. Before that, he primarily worked with the second-team offense during training camp, which along with the injury robbed him of a chance to build a rapport with quarterback Sam Bradford. Is Agholor going to be a star? We don't know, but are willing to bet with another year in the league and with a little good health, he should easily be able to improve on such sad numbers. The answer is yes, it could, but not a lot. The Eagles didn't have anything close to a consistent or dependable target on the outside last season, considering Jordan Matthews lined up primarily in the slot. The next leading wideout on the team: Cooper with 327 yards — sixth behind tight ends Zach Ertz and Brent Celek as well as running backs Darren Sproles and DeMarco Murry. All told, Cooper, Huff, Agholor and Austin combined for 84 catches, 1,150 yards and seven touchdowns. That's it. That's basically all the production the Eagles had on the perimeters, both sides of the field, and that's not even including any numbers they might've accumulated out of the slot. In short, it was nothing less that disastrous, and we haven't even covered the drops. Yet. Time will tell how much Matthews lines up outside the numbers, but all indications so far are he'll continue to see plenty of work in the slot. That certainly isn't a bad thing, as only a handful of receivers in NFL history have enjoyed a more productive first two years in the league. If anything, Matthews is underrated in this town after racking up 152 receptions, 1,869 yards and 16 touchdowns already. He came up just three yards shy of 1,000 last season. There's a good possibility Matthews hasn't even peaked yet, and we could easily make a case for why he'll be even better in 2016. Until we see his usage, however, it's difficult to say by how much. As long as the Eagles view him primarily a slot receiver, his numbers might not climb a whole lot higher. At worst, Matthews is going to be the same player he's been — minus a few drops hopefully — which, again, is far from a knock. By far, the most irritating aspect with this group is not the talent. To the contrary, Matthews is very good, Agholor has ability and even Huff is dangerous once the ball is in his hands. Of course, that not-so-trivial caveat was the problem with all three last season. These guys couldn't hang on to the ball, leaving untold yards on the field. Matthews said it himself in the locker room after their Week 17 win over the Giants. He had dropped a pass that would have put him well over 1,000 yards for the season. Truth be told, he dropped so many passes, he might've been almost on par with the Jackson/Maclin-esque 1,300-yard seasons the previous two years. Thing is, it's hard to say whether the issue was of everybody having the dropsies was a coincidence, or it's an epidemic that will continue in the future. All we really know is it sure is frustrating.